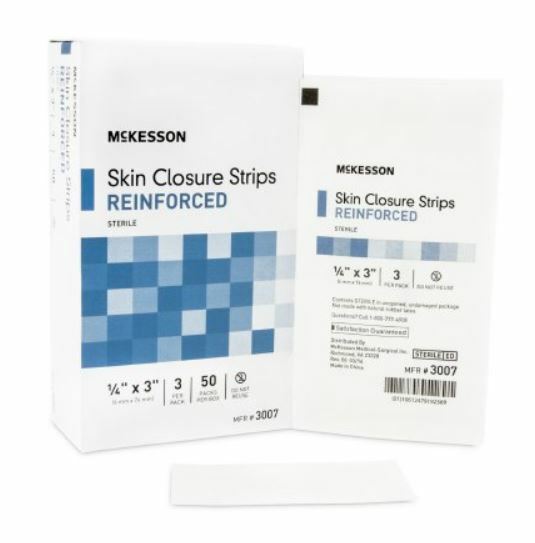 McKesson Medi-Pak Performance Plus Skin Closure Strips are skin-friendly medical adhesives with breathable material that helps minimize the chance of skin maceration. Added strength for secure wound closure. Sterile, single use skin closure strips that measure 0.25" x 3". Reinforced strip that is white in color. Latex free. Comes 3 strips per sterile pack and 50 packs per box.